This is the 'Monitor' of the Texas Masons. 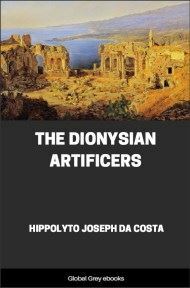 It describes ceremonies, including those used for the three major initiations and the burial rite. 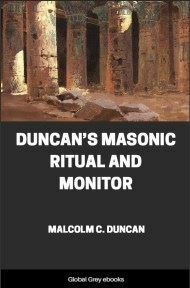 The Monitor has model speeches and prayers for various occasions, and defines the order of Masonic processions. The Texas Monitor is similar to the monitors of other states. Keep in mind that for copyright purposes, the source text for this is an older version of the Texas Monitor. The current Texas Monitor has undoubtedly changed slightly since this edition was published. When the brethren have assembled in the Lodge-room, that is to say, at the place designated in their dispensation or charter for holding the Lodge, and the time or hour for meeting has arrived, the W. Master gives one rap with the gavel, and directs the brethren to be clothed, the officers to assume their Jewels, and repair to their respective stations and places, except the Tiler. The Tiler's place, when the Lodge is at labor, is without the door. 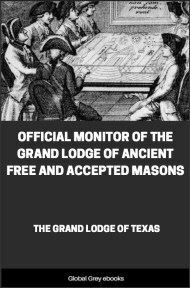 If it is a Stated meeting, the Lodge should be opened in the Master's degree, and all business transacted in the order and manner required by the By-Laws of the Lodge, and the Constitution and Edicts of the Grand Lodge. Most holy and glorious Lord God, the Great Architect of the Universe: the giver of all good gifts and graces: Thou hast promised that where two or three are gathered together in Thy name, Thou wilt be in the midst of them. In Thy name we assemble, most humbly beseeching Thee to bless us in all our undertakings, that we may know and serve Thee aright, and that all our actions may tend to Thy glory and to our advancement in knowledge and virtue; and we beseech Thee, O Lord God, to bless this our present assembling, and to illuminate our minds by the divine precepts of Thy Holy Word, and teach us to walk in the light of Thy countenance; and when the trials of our probationary state are over, be admitted into THE TEMPLE "not made with hands, eternal, in the heavens." Amen. Response: So mote it be. Great Architect of the Universe: In Thy name we have assembled, and in Thy name we desire to proceed in all our doings. Grant that the sublime principles of Freemasonry may so subdue every discordant passion within us, so harmonize and enrich our hearts with Thine own love and goodness, that the Lodge, at this time, may humbly reflect that order and beauty which reign forever before Thy throne. Amen. Supreme Grand Master of the Universe: We would reverently invoke Thy blessing at this time: Wilt Thou be pleased to grant that this meeting, thus begun in order, may be conducted in peace, and closed in harmony. Amen. 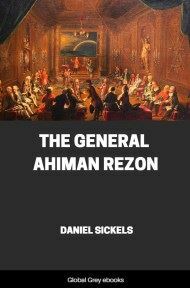 The W. M. says: Brethren, before I declare the Lodge opened, let us invoke the assistance of the Great Architect of the Universe in all our undertakings. May our labors, thus begun in order, be conducted in peace, and closed in harmony. Amen. The Master then, in the name of God and the Holy Saints John, declares the Lodge duly opened in the first degree in Masonry. 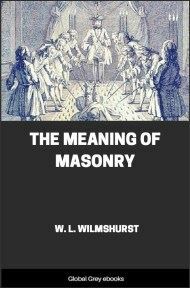 The W. M. says: Brethren, before I declare the Lodge opened, let us fervently supplicate the Grand Geometrician of the Universe, that the rays of heaven may shed their benign influence over us, to enlighten us in the paths of virtue and science. Amen. The ways of Virtue are beautiful. Knowledge is attained by degrees. Wisdom dwells with contemplation. There we must seek her. Let us then, my brethren, apply ourselves with becoming zeal to the practice of the excellent principles inculcated by our Order. Let us ever remember that the great objects of our association are the restraint of improper desires and passions, the cultivation of an active benevolence, and the promotion of a correct knowledge of the duties we owe to God, our neighbor, and ourselves. Let us be united, and practice with assiduity the sacred tenets of our Order; ever remembering that where brethren are, there should be peace and harmony, and each should wish for the good of the whole. Supreme Grand Master! Ruler of Heaven and Earth! Now, that we are about to separate and return to our respective places of abode, wilt Thou be pleased so to influence our hearts and minds, that we may, each one of us, practice out of the Lodge those great moral duties which are inculcated in it, and, with reverence, study and obey the laws which Thou hast given us in Thy Holy Word. Amen.